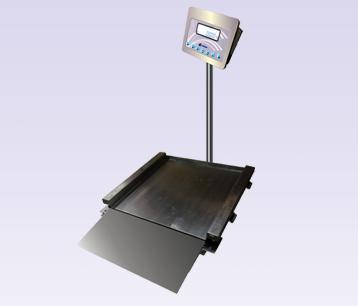 Low Profile Stainless Steel Floor Scales, S.S Low Profile Floor Scale, Floor Scales Manufacturer, Mumbai, India. * Low Profile construction with S.S. ramp (Optional) to avoid pit in production area. * Incorporates multiple number (4 nos) of high quality stainless steel IP 67/68 shear beam loadcells. * Stainless Steel S.S. 202 Platform (S.S.304/S.S.316 optional). * Stainless Steel IP67 GLP compliant Indicator with Real Time Clock (Optional). * Large LCD dispaly with white backlite.